I purchased this clock one year for my parents anniversary present. My father wound it every week (it's an eight day clock) and enjoyed how well it kept the time. My mother loved how it went with the decor in the room. It was kept on the mantle over the fireplace for years. The soft green color of the columns and the relief panel on the top were part of what she liked. The columns were similar to a pair of fluted brass candle sticks that sat near it. I found it in an antique store in a small town on the southern coast of New Jersey. The man who sold it to me had restored it himself. 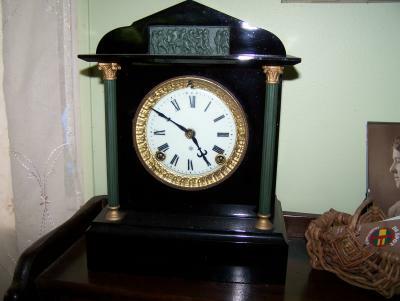 He said it was made around 1910-1915 by the Ansonia Clock Company in New York City. It's cast iron, so it's very heavy. After my parents passed in 2001, I reclaimed it and have had it in my dining room ever since. to be in great shape. I don't know if you know much about the company that manufactured your clock or not, but it has a very interesting history. You can find it here. Thanks for sharing with us.